You will need a 5- to 6-quart Dutch oven and steamer or a tamale steamer for this Mexican-inspired main dish recipe. For a shortcut version of the homemade sauce, substitute canned enchilada sauce. Soak cornhusks in hot water for several hours or overnight until soft. Prepare Shredded Beef and Pork as directed. Cover and refrigerate shredded meat and reserved broth. For sauce, wearing disposable plastic gloves or small plastic bags, remove stems and seeds from peppers. Place peppers in a large saucepan; cover with water. Bring to boiling. Reduce heat to medium. Cook peppers, covered, for 5 to 8 minutes or until tender. Strain liquid and reserve. Place peppers in a blender or food processor with 1/2 cup broth from Shredded Beef and Pork, the garlic,1/2 cup of the reserved pepper liquid, 1/2 teaspoon of the salt, the oregano, and the cayenne pepper. Cover and blend or process until smooth. For the dough, in a large bowl beat shortening, lard, and remaining 1 teaspoon salt with an electric mixer on medium speed for 2 minutes or until smooth. Continue beating; add masa harina alternately with 2 cups of the reserved met broth. (To test dough, drop 1/2-teaspoon ball of dough in cold water. When the dough floats, the tamale dough is ready for shaping.) The mixture will be the texture of mashed potatoes. Add more broth, if needed, to reach desired consistency. Drain cornhusks well; pat dry with paper towels. To assemble each tamale, starting about 1 inch from the narrow edge of the husk, spread about 2 tablespoons of dough into a rectangle 3 inches wide and 4 inches long so one of the long sides of the tamale dough is at the long edge of the wrapper. Spoon 1 heaping tablespoon meat filling down center. Place 2 olive halves in the center. Fold the long edge of wrapper over the filling so it overlaps dough slightly. Fold the narrow end of husk over filling, then continue rolling. If desired, tie strips of cornhusk or a 100-percent-cotton kitchen string around center of tamale. To prepare steamer, place a cone-shape piece of aluminum foil, point side up, in the center of steamer basket. Stand tamales upright around cone; place basket in steamer or large Dutch oven. (Don't pack tamales too tightly, but fill the space.) Place about 1-1/2 inches of water in the bottom of steamer. Bring to boiling. Cover steamer. Reduce heat to medium-low. Steam for 45 to 60 minutes. Tamales are done when dough easily pulls away from cornhusks and is spongy and well-cooked throughout. Makes 36 tamales. You can wrap tamales in foil and refrigerate up to 2 days before serving, or freeze them up to 3 months. 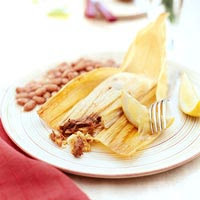 To reheat refrigerated tamales, steam them still wrapped in the husks, for 8 to 10 minutes or until heated through. To reheat frozen tamales, take them directly from the freezer, wrapped in foil (do not pack tightly), and heat them in a 350 degree F oven for 1-1/4 to 1-1/2 hours. For a milder tamale, use 4 dried ancho and 2 dried New Mexico peppers. Calories 179, Total Fat 11 g, Saturated Fat 3 g, Monounsaturated Fat 5 g, Polyunsaturated Fat 3 g, Cholesterol 21 mg, Sodium 233 mg, Carbohydrate 14 g, Total Sugar 1 g, Fiber 2 g, Protein 8 g. Daily Values: Vitamin C 2%, Calcium 3%, Iron 7%. This entry was posted on 3:58 PM and is filed under Dutch Oven . You can follow any responses to this entry through the RSS 2.0 feed. You can leave a response, or trackback from your own site.